In the early years of our country, a poor school teacher, Justin Morgan, receives a horse and her tiny colt in payment for some work. He wishes he had been given money instead. Hoping that he might sell both horses for a fair price, he asks his student, Joel, to break in the colt. To his surprise, young Joel soon discovers that this small, brown creature has special abilities: "Bub" can pull more than a team of oxen, and he can run faster than a racehorse. But while the sturdy little runt wins contest after contest, all Joel wants is to save enough money to buy the beloved "Bub." 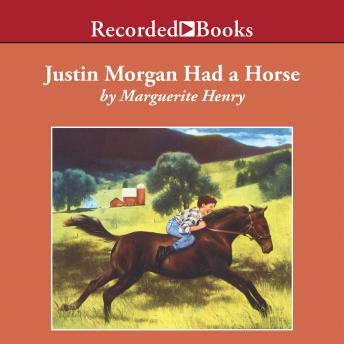 Justin Morgan Had a Horse is the story of the love between a young boy and a very special horse. A classic of children's literature, it also traces the history of one of the most famous breeds of American horses-the Morgan. Marguerite Henry has earned enduring popularity for her children's books, which include Misty of Chincoteague, also a Newbery Honor book. It was a good book however, narrator was a little to slow and too deep, also I think the book shouldn't be 4 hours long.